International Youth Day (IYD) is an awareness day celebrated on the 12th of the August every year. The purpose of the day is to make the youngsters provide attention to the legal and cultural issues around them in the society. Youth category people come under the age of 15 to 24. It is a must for the youths to know about the awareness day and the purpose of it. Ideas to spread awareness about the day includes personalized bracelets, caps, rings, T-shirts and more on with the messages related to Youth Awareness. Among these, wristbands are considered as the best accessory because of the evergreen fashion trend it has among the youngsters. Where to buy the Youth Group Bracelets? 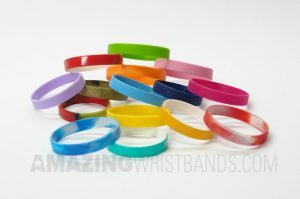 AmazingWristbands.com is the leading provider of quality silicone wristbands online. Since we offer completely customizable bands you can have your personalized message on the bands. Besides that, we have the option to customize the color, style, and fonts for the bands based on the theme you are planning for. Popular phrases, namely "WWJD" or "I Believe" can be used on the bracelets to motivate youth group members focused on their cause. Messages such as "I fight for my society" may also help. Have any customized photo or the logo printed on the bands. Any bracelets with a catchy phrase can be sold to raise funds for your organization. With no minimum order requirements on our wristbands, you can buy just a few or many to support your youth group activities. How to Build Youth Group Wristbands Online? Create your own custom youth group bracelets online with our easy wristband builder. Simply select your style, lettering, font, colors, effect and add any custom messages for the front, back and even the inside of the wristband. In addition to the half-inch standard wristbands, AmazingWristbands.com also offers super popular slap bands that “snap” to a person’s wrist, as well as thin half-inch bands, thicker one-inch bands, adjustable bands, USB bands, silicone rings, LED bands, Medallion bands, and silicone key chains. Cool special effects such as swirled or segmented colors, glitter, or glow in the dark. We do not charge any mold fee. Delivery within 24 to 72 hours is applicable for selected styles. Standard delivery within 5 to 10 days.